To me the objects might explain a spatial relationship of objects, an archetypical form, a simple or complex motion, might point towards oddities of nature, or might present a subtle perceptional limitation; but they always connect me to an idea. Many of the recent works start as a combination of objects linked by an idea, force or action (fields of force, waves, time). Some abstract phenomena. Over the course of the creation of the work these are often connected to an individual by concepts of revisionist history. Newton as Alchemist, alchemist as scientist, Platonic geometrist as truth seeker, radio inventors as mystics, etc. They then become part of a created narrative lecture. I might not even know the lecture but marvel at the thought of what the instruments might make reference to or how they might have been used. Like finding an object but not knowing its application. That is as much part of the intrigue. The notion of my current Philosophical Objects did not start based upon research of the past. The studio works I created were the result of me trying to explain something to myself or understand something I could not abstractly resolve in my own thoughts. While I always referred to them as part of the Instrument Series this wonderful historical concoction of the Philosophical Instrument did not come to my attention until recent years. 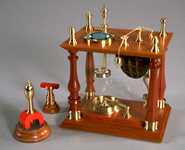 Historically these instruments of communication were an extension of the realm of scientific instruments that might include research apparatus or theory demonstrators. With this in mind the bit more abstract Philosophical Instrument is a natural evolution in the instrument makers trade. They were the first lecture aids and often used to enable the audience to visualize the topic of the discussion. Of course many of these instruments existed as parlor entertainment and hearken back to an age when attendees might be treated to a lecture or demonstration at an otherwise social event. Some of the great ornamental turners of the last century often found themselves cast in the role of the performance artists of their time working away on a project while the partygoers looked on. This seems like such a wonderful event of the past. I define "Perceptual Objects" as things that extend our ability to see. Whether it be to comprehend our environs and physical space, the laws of nature that surround us, force fields our unaided senses cannot detect, or simply to wonder, these objects are demonstrative for me, yet connect me to my greater space. Tthe plumb bob is one of my favorite examples. A simple utilitarian device that depicts so much; I am still exploring the wonderful simplicity of it. It demonstrates gravity, points towards the center of the earth, is always perfectly vertical, and, if swung like a pendulum, can show us how the earth rotates (and never mind the "New Age" pendulums of truth). The ideas that the objects link to connects me to a past thought process. Whether flawed or ground breaking, current or antiquated, it makes no difference. These simple revelations of our existence, our place in the woods or in the universe that surrounds us, or even the simple wonder of the lodestone, connects to archetypical ideas that attempted to explain our connection. Some sought to understand a simple oddity of nature and some sought the single thing; the philosophers stone, the geometric formula, the physics theory; that might connect it all.